"Why are the people in Brian Kershisnik's paintings so ugly?" This question from a visitor to the Central Utah Art Center's just-concluded exhibit of recent paintings by Kathleen Peterson and Brian Kershisnik sent the director, Adam Bateman, and me searching for an answer. It wouldn't help to point out that beauty is usually found in the eye of the beholder. Nor would it satisfy to say that Kershisnik's figures seem to refer to specific individuals, even if meant as archetypes. Nor would it suffice to say that Kershisnik's men and women often seem possessed of an ethereal beauty, delicacy and grace. What I felt we needed was some understanding of what, in the eye of the questioner, was wrong with these otherworldly figures. One answer lies in the history of figurative imagery in Utah: in what we have come to expect to see, and how what some of us desire differs from what others want. It's a story that begins with immigrant taste: the powerful predispositions of the populations that converted, emigrated, trekked across the continent, settled the wilderness, and founded an energetic and durable civilization. That their strongly conservative tastesand not just in artsurvive is no puzzle; they regenerate themselves anew in each succeeding generation. But the heirs to this tradition now live alongside those who acquired their tastes from schools, the media, from travels abroad, or brought them along when they, too, immigrated. Viewers of art in Utah today believe what we want to see, and what we should see, is reality. We just lack any agreement on what that means. In the beginning, of course, there was one vision and one idea, though the many regional styles brought together in the relocation to Utah gave that idea a multifaceted look. Early Utah history is marked by a unanimity of purpose that bent all creative energies to collaborative ends. Aesthetics were part of this from the beginning, even before a generation of promising talents was sent east to learn a more conventional way to make art. Their art would be realistic, figurative, narrative, allegorical, and above all, didactic: in short, illustration with a veneera nod, really, and no moreto modern taste. Over time, that surface compromise gradually evaporated, until the standard became a transparent window, through which the viewer gazes without obstruction to eye or mind. There is no depicter, there is no depiction: only a direct apprehension of eternal reality, as accessible to the senses as to the soul. The presence of one woman among that first generation of artists given formal training outside Utah did not amount to a reaction against consensus, but it lets us see a clear alternative to the dominant impulse. Comparing Minerva Teichert to Gutzon Borglum or Avard Fairbanks, we might say that in painting Pre-Columbian America and the origins of her church, Teichert painted spiritual and moral life as contents of the world she knew, while Fairbanks depicts the life he knew transformed by his ideals into someplace not of this world. Fairbanks is dangerously close to the vein of kitsch so evident in today's home décor: anonymous happy families, praying children, and the presence of the Savior. It's the world we wish for, not the one we inhabit or ever should, and these are not works of art; they might be best seen as talismans: magic objects whose presence is meant to bring about the good life they depict. On the other hand, compared to John Hafen and the other male artists who were sent to Paris, Teichert stands out for single-minded devotion to her calling. She didn't paint conventional subjects on the side, nor did she expend a lot of effort on the peripheral details in her historical epic. No one else matches her desire to tell in paint, in a modern style, the stories she loved. It's as though having grown up on the prairie listening to the stories that she would one day paint, she never stopped seeing them the way that child imagined them, or presenting them with the vividness and revelatory detail they retained for her. Teichert fought for her art in a culture that never really embraced her. In so doing, she helped set a standard for self-expression that would enable other observant Mormons to make secular art. Brian Kershisnik and Kathleen Peterson are beneficiaries of that freedom. But with independence from social and institutional pressure comes the loss of encouragement and support. Self-questioning and the need to divert creative energies to financial concerns are just two ways the modern Utah artist resembles the contemporary American artist at large. It’s another way the unique identity of the Utah artist is vanishing. So looking around CUAC's gallery, we may well ask how much remains. I would reply that in the present case, Kershisnik and Peterson both approach their work in a spirit of reverence that draws on their religious origins and leads them to observe the world carefully. One still searches for signs of what lies beyond the visible, while the other shows us how much the visible contains. Brian Kershisnik is well represented on his web site by an archive of his work going back to 1987. Browsing dozens of paintings, it becomes apparent that he has been pursuing the same purpose for at least that long. His subject matter unfolds, but there is little change in the technique he uses to present it. There is no space inside any of these canvases. Backgrounds are meticulously squared up to the picture plane. Graduated fields that might otherwise recede are flattened by rows of identical spots, like kernels of corn on an unrolled cob. Figures sometimes overlap, but their encounters are of allegorical rather than visual import: sisters stand in clusters; a couple overlaps as one reaches out to grasp the isolated figure of an interloper. The figures that lie on these flat grounds are only slightly less flat, with minimal shading confined to refined faces almost always seen in profile or three-quarters view. Predominantly young, pale, their European features set off by hair set in a plain style, or cut as severely as the ankle-length shifts worn by the women, they pose in stiff postures and unnatural attitudes, surrounded by objects of symbolic import: crowns, banners, fires, snakes. Textures abound, some covering large areas in identical marks, others varying, like the leaves on the dresses of the women in "Fall Coming Like Three Sisters," which are thin at the shoulder but dense at the hem. Movement is rare, though figures may lean towards one another. 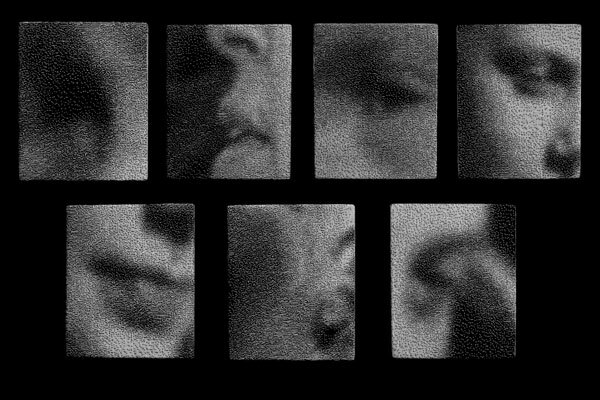 The faces appear calm, distracted, but they seem lost less in reverie than in thought. Kershisnik has written that art may come about when a tear in the fabric of life permits us to view the core reality beneath. His titles sometimes cast doubt on the enterprise: "Unknown Allegory," "Tricks on Paper," "They’re Just Doing This," "Dogs with Paintings of Women." These are allegories, not events: allegory, its timeless essence unchanged from Byzantium to the middle ages to Mormon Utah. But Kershisnik makes allegories of parts of life that those who view his work may be unaccustomed to having shown on a par with spiritual longing. The "Unknown Allegory" represents a woman bestowing peaches on two men, one apparently a partner, the other grasping not only the peach, but also the wrist that holds it. 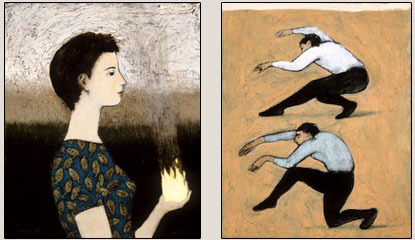 "The Burning Gift" held in the palm of a woman’s hand may not burn her, but there is reason to believe the recipient will not escape so easily. Perhaps this is what someone found ugly in the gallery: not the persons, but the predicaments they introduce into their otherwise modulated world, the way the serpent brought original sin into Eden. In contrast to Kershisnik, Kathleen Peterson's paintings of trees are both more accessible and less challenging. Yet if anything, Peterson occupies an even more radical point of departure from the conventions both artists inherited. Landscape and the figure are the two mainstays of Utah art, and they naturally reinforce each other: figures imply a setting that the mind intuitively seeks, while places acquire scale and identity from the figures that inhabit them. In previous works, including those in A World of Faith, Peterson has shown mastery of the close symbiosis figure and landscape can achieve. But the trees that make up her recent work are not landscapes. Instead, they are portraits of the highest caliber: depictions of events that happen to take place continually, on a living body, over many years, until the essence of a being can be read by the discerning on its surface. Peterson adds to this revelation a layer of narrative that brings them to life, primarily through exploitation of our instinct to read from left to right. In "Roots and Wings" shadows among the foliage eventually become birds that could be taking flight or landing. The energy the eye picks up as it scans across the tree tends to carry them along with itout into the air. In "Orange Tree," "Ponderosa," and "Banyan Tree," the masses of leaves, while balanced, carry the eye from the sky at left to the right margin of the picture. Lest this sound mechanically repetitive, each image carries it off differently. "Eucalyptus," otherwise a twin to "Ponderosa," bends like a candle flame in the wind, while five "Aspens" leap clear of some tall undergrowth their foliage echoes as they scale the sky. In "Kamikani," the tree resembles a flamboyant sumi-e brushstroke connecting the Earth to the Moon. In addition, each tree handles the sunlight that it exists only to exploit in its own unique way. Backlit trees glow as if bearing an aura. Some are penetrated by light, or their fruit is shaded where they are not. In others, overhead sun ignites those branches it can reach, revealing the structure that supports these cities in air. From where I view them, it seems these two painters have undertaken a departure from their places of origin to a more democratic way of seeing. Brian Kershisnik has chosen to cleave to the convention that there is another reality one can sometimes see through the veil of illusion in which we dwell. But he enlarges this way of seeing to include not just the way things should be, but also much of the complex and difficult way they are. Kathleen Peterson's loyalty is to the whole story, not just the moment of pointed insight. Both expand what it is possible to see in a moment captured on a wall. In the Salt Lake Art Center's Material Culture: the Fine Art of Textile, which opened June 24th and hangs through September 30th, six women explore civil and social concerns through a variety of textile media including weaving, hand and machine aided stitching, felt making, quilting, embroidery, and painting. "All use textile and associated techniques," writes Jay Heuman, curator of education at the Salt Lake Art Center and curator of this exhibit, "but each is a solitary and significant representative of one technique without duplication. All are included for their common threads and divergent techniques." Heuman points out that there is "some recurrent theory, something beyond technical manufacture which incorporates a theoretical foundation and approach that is symbolic." For example, Jean Hicks installation entitled Filter is overflowing with personal symbolism. A felt dress literally grows throughout the duration of the exhibit. It has been infused with nasturtium seeds, which are watered daily and put under the appropriate lighting to encourage growth and flowering. Potatoes wrapped in felt on a mound of dirt are beginning to sprout, and a hand, made of a dirt and clay mixture, rests on a pedestal. Everything is white with the exception of a red hat. Wendy Huhn is not alone in her contemporary quilting, as is ably demonstrated by The Utah Museum of Fine Arts (UMFA) exhibit Quilts Rooted in Tradition: Art Quilts from the Rocky Mountain Quilt Museum, on display through October 15. As this exhibit shows, quilting has evolved from a utilitarian craft to a respected art form. Art quilts, unlike bed coverings, are generally designed with an "intent: a specific thought, idea, or message." In Quilts Rooted in Tradition, sixty-four quilts showcase an assortment of movements in quilting from 1980 to the present. Some of these quilts move from traditional patterns to take on contemporary thought. 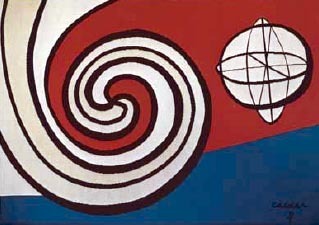 Others portray a political message, as in Marta Amundson's "The New Holocaust," or "Desert Storm" by Terrie Hancock Mangat. "Desert Storm" is a commentary on war, oil, and America. It's a wall-sized work littered with skeletons, matchbox cars, gas pumps, and planes (or are they birds?) made of American flags. At the other end of the spectrum is "Shrine to the Prairie Chicken," in which Betsy Cannon's mission is to add a little whimsy to the world. As she states, "we spend too much time on the negative and need to focus on the silly things in life." Whatever approach the artists take, their goal is to communicate a message through quilts. When did quilting cross the craft line? It began in 1976 during the bicentennial when the quilting movement was revived. In 1979, when Jonathan Holstein curated an exhibit at the Whitney Museum of American Art of Amish quilts, the art world took note. 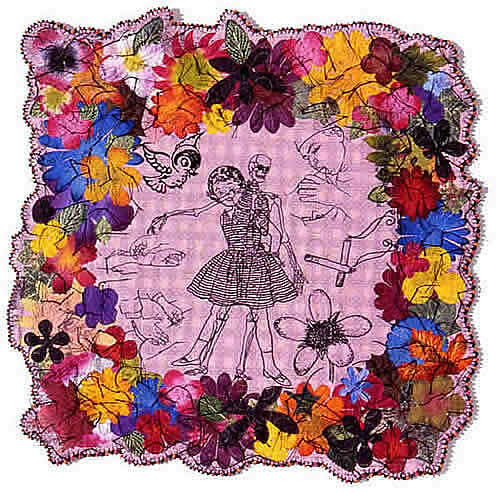 Quilting no longer remained a women's handicraft and men also joined the movement. This movement continues at The Kimball Art Center in Park City, which is hosting three contemporary textile shows. * Material Matters:Art Quilts from Front Range Contemporary Quilters is on display in the Main Gallery through July 23. This juried exhibit consists of more than forty quilts by members of the Front Range Contemporary Quilters. Like in painting, the subject matter in these pieces moves from representational -- as in Melody Randol's "Stone Tapestry" a detailed rendition of a southwestern landscape -- to the abstract -- as in Elaine Spencer's "Lichen Flowers," which abstractly captures the feeling of lichen growing on a rock. Juror Alice Zrebiec's comments on this exhibit provide an astute analysis of the art-making process of quilting. She writes, "Material does matter. Carefully chosen fabrics  selected from commercial goods or specially dyed or printed to create desired colors or effect  are pieced together or appliquéd. Artists further vitalize their compositions through complex manipulation of fabric pattern and by adding overprinting or embellishment. They create painterly effects by juxtaposing or layering fabrics of different opacities. Stitching is used not just for functional purposes such as joining one fabric shape to another, but it is also used imaginatively to create movement, dimension, texture, and decoration. Some artists push the boundaries even further and literally think 'outside the box' of the conventional quilt rectangle, creating shaped pieces that present their subject in a fresh manner." In the Kimball's Garage Gallery, a related exhibit, Sheri Rice: Paper Quilts, hangs through July 31. Rice, a mixed media artist, creates one-of-a-kind paper quilts by combining recycled and found materials in an interesting combination of collage and quilting. Like Robert Rauschenberg, who finds the "inherent usefulness and dignity of all materials," Rice "creates art from the discards of others." Her works are a collection of book pages, music sheets, obscure photographs and found materials stitched together as a whole. Hanging concurrently is the third textile exhibit at the Kimball, Sheryl Haler: Textile Sojourns, in the downstairs Badami Gallery. Haler's work explores earth, nature, myth, and ritual. Some works are small as in the shoe-like pieces; others are life-sized installations of elaborate dresses with horns mounted on top. Metaphor, symbolism, and culture are explored in cloth. As the artists states, "They are talisman and sacred . . . They are mementos, tributes, discourse, and questions . . . They are a mapping of a life's journey." If, by visiting these exhibits in Park City and Salt Lake, you've seen where fiber art is going, be sure to head to Provo to see where it all began. Tapestries: The Great 20th Century Modernists, on view at the Brigham Young University Museum of Art through July 24, presents modern painters and sculptors who were inspired to transfer to tapestry some of their masterpieces. 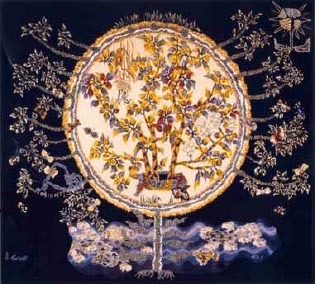 The modernists' reexamination and reinvigoration of the traditional art of making tapestries can be seen as a major influence on the current acceptance of textile art. "This exhibition is a fusion of new and old  the bold abstract designs of modernism and the ancient techniques of hand-woven tapestry," says BYU Museum of Art Curator Paul Anderson. "And it is a surprisingly appealing combination. The simple geometries and pure colors of much modern art transfer readily to the loom, and the large scale and soft texture of tapestry give these designs a sense of drama, warmth, and richness." The resurgence of tapestry art has been credited to Jean Lurçat, a French surrealist painter, who developed a system in the 1930's that simplified the complicated process of weaving. |3| Nineteen woven works in this exhibit represent not only Lurçat, but also Pablo Picasso, Alexander Calder, |4| Jean Arp, Fernand Léger, Le Corbusier, Henri Matisse, Vassily Kandinsky, Victor Vasarely, Georges Braque and Marc Chagall as well. The MOA is one of only six American museums, and the only one in the western United States, to host this impressive group of tapestries culled from a dozen collections throughout Europe and America. Whether by default or by design, the UMFA, Salt Lake Art Center, Kimball Art Center and BYU MoA have given Utahns a rare opportunity to examine an emerging and expanding genre of Contemporary art in detail and breadth. Whether you simply love quilts, have a passion for the modernist masters or are intrigued by what visual feats artists can achieve with fabrics, July is the month for anyone with an interest in textiles. *another quilt exhibit is also currently up at the Brigham City Museum (see page 8).